Bake The World A Better Place [K7129] - $9.00 : Yarn Tree, Your wholesale source for cross stitch supplies. Cross stitch pattern from Tiny Modernist. Do you know a baker? "Bake the World a Better Place," is a great design for the baker in the family. 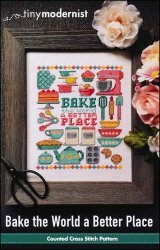 This design features all the utensils you need for baking....mixing bowls, mixer, spatula, rolling pin, measuring spoons, flour, sugar, etc. Stitch count 100w x 128h. Stitched on #8221 Zweigart Aida 14ct White.